I’m a pretty big fan of the No More Heroes franchise, especially the first. Ostensibly billed as an action game, it often felt more like a crazy slice of life in my eyes — a life where laser sword-wielding protagonist Travis Touchdown would spend his days looking for work disposing of poisonous scorpions or trying not to set himself on fire fuelling cars at a local garage before setting out to climb the ranks of an assassin’s guild by killing everyone above him. Now, nine years after the last installment, we have a new entry on the Nintendo Switch. The setup is that Bad Man, the father of an assassin killed in the first game, sets out to murder our protagonist in turn. However, during the assassination attempt they both get sucked into a Death Drive virtual reality unit that can fulfill a single wish for anyone who completes every game made for its hardware. It’s a pretty great setup. Sadly, it’s not a great experience. 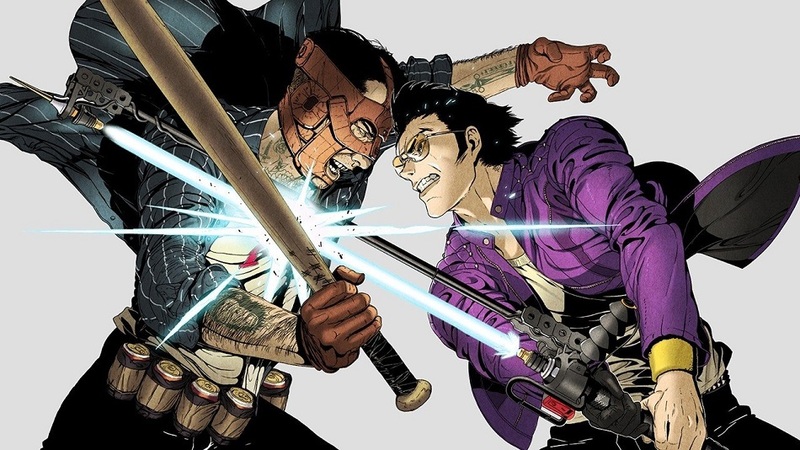 The gameplay of Travis Strikes Back is generally presented in a hack-and-slash style that allows one or two players to team up, but there’s usually a twist as the game takes them through its various virtual worlds. One level may require winning a drag race in order to proceed, or there may be small platforming sequences or lever-flipping puzzles that have to be navigated en route to the boss of each area.These twists range from small changes in perspective to the type of madness found in something like Nier, with bird’s-eye views turning playable characters into dots in the distance, or there might be guns blasting away at the players from great distances in the background. 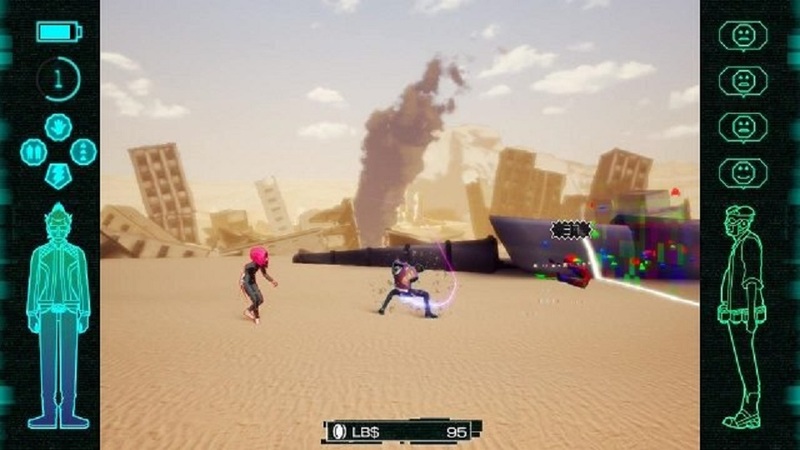 Travis and Bad Man both have slight differences in how they fight and what their stats are, but they’re both capable of getting stuck in to eliminate the rampaging “bugs” infesting each area inside the VR world. They both have a basic rushdown attack for weaker enemies, and both can use stronger attacks to do more damage or break through shields. They also have access to a bunch of upgrade chips found in each level which allow for more interesting effects like slowing down enemies, healing themselves, or psychically chucking bad guys across the room. The biggest issue I have with the combat, and something I view as a grievous sin in most action games, is that the dodge doesn’t cancel moves in order to facilitate a quick exit. This means that tapping it midway through an attack is meaningless, even if the incoming threat is clearly identified and the dodge button pressed in plenty of time. On the normal difficulty, I found it was more effective to ignore the dodge and simply tank hits with Travis’ face and hammer away at tougher enemies with strong attacks, pausing only to use a freshly-charged super attack or special skills once they were available. There’s a decent variety of enemies, at least — weak ones killed in a single swipe, gun emplacements, really boring tank-style enemies who spend way too long defending pretty much all the time, and more. The skill chips do their best to keep things fresh, but the combat could and almost certainly should be more complex overall, perhaps by mixing in throws for blocking enemies or the like in order to keep things moving at all times. What’s more, some sections seem to last forever, soldiering on relentlessly long after the idea behind them has gone stale. Stage 2’s spinning mazes and invincible, instakilling ghost might have been cute in moderation, but they’re a mediocre idea stretched to breaking point by the time they’re done. 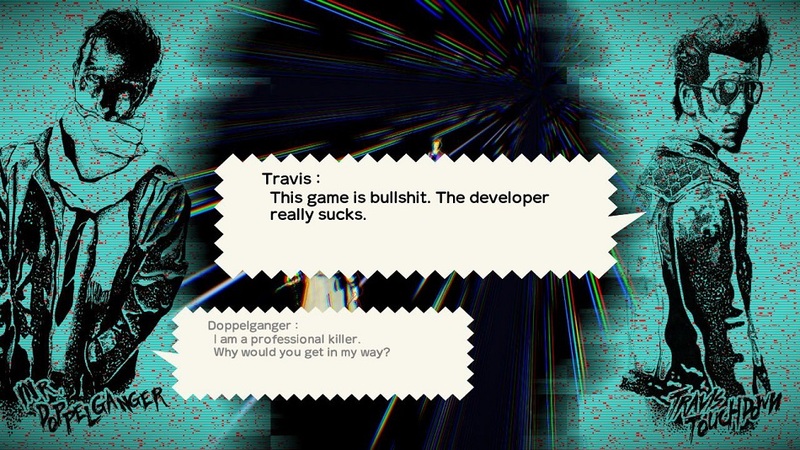 There’s also a progression system where characters can be leveled up with small health and attack boosts, but the money earned from collecting coins and finding cash stashes throughout each stage seems pointless — all Travis can buy with his earnings are more indie game inspired T-shirts between stages. Given that it’s difficult to see what they look like during gameplay, there’s little reason to splurge out on them. At least the series’ characteristic sense of style largely persists. 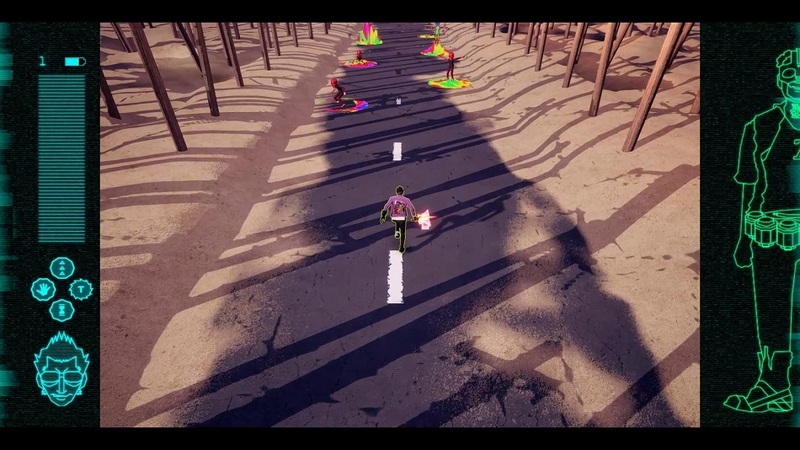 There are plenty of neat ideas, such as timeworn gaming magazines showing cheats that can be entered in each stage from the correct location (written by a gamer who looks a lot like Meijin from Let it Die) and between stages Travis departs on a visual novel-style adventure to reclaim missing Death Drive games. 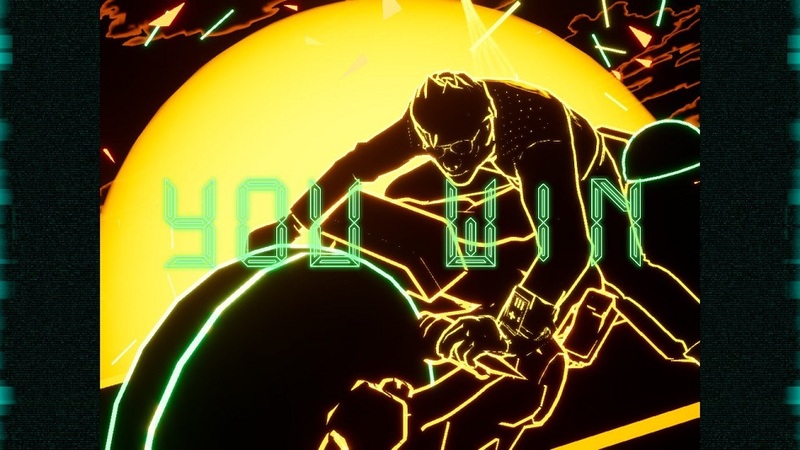 While there are no branching paths and the dialogue is pretty straightforward, there are plenty of of nods to previous Suda games, as indeed there are throughout the main stages as well. Anyone who’s followed Goichi Suda’s career will be treated to tons of callbacks, in-jokes, and substantial references throughout. The flipside? Anyone going in cold may be left a little bewildered. Disclosures: This game is developed by and published by Grasshopper Manufacture Inc. It is currently available on Nintendo Switch. This copy of the game was obtained via publisher and reviewed on the Switch. Approximately 15 hours of play were devoted to the single-player mode, and the game was completed. 1 hour of play were spent in the co-op couch multiplayer mode. Parents: According to the ESRB, this game is rated… nothing, yet. It’s not as bloody as previous entries, but it still contains plenty of swearing and killing so it’s not exactly child friendly. I mean, nearly everyone in the game threatens to kill one another constantly. Deaf & Hard of Hearing Gamers: This should be fine. I can’t recall any parts that required sound to complete puzzles or the like, and there are red indicator arrows for offscreen enemies which should help to cut down on surprise attacks that can’t be heard in advance. Remappable Controls: No, this game’s controls are not remappable. There’s also no diagram, so generally Y is used for a weak attack, X is a strong one, B jumps and A dodges. The triggers are used for special moves, and holding down the left trigger in conjunction with the face buttons allows skills to be fired off. 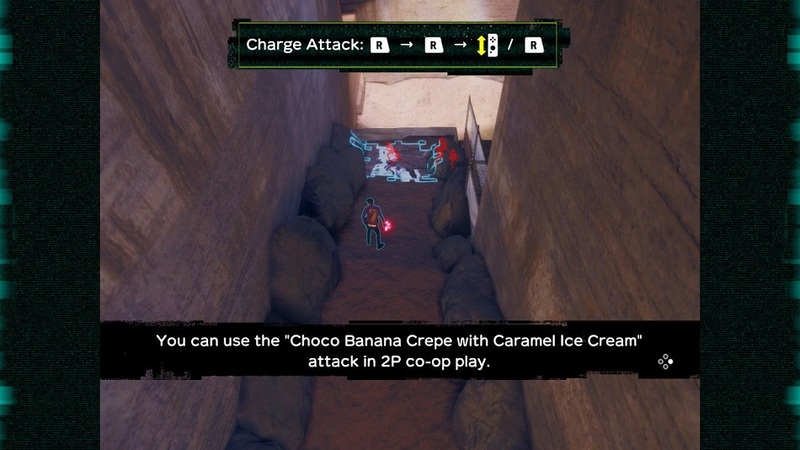 Recharging players’ attack power is done either by shaking the JoyCon, or clicking the left stick and flicking the right one slightly back and forth. Below is just one example of a minigame control scheme.